Initially a scrappy post-grunge, pop-punk outfit (with greater emphasis on the pop part), the band was arguably more recognized at first for its openly gay members (Bottum had memorably come out on MTV a few years earlier) than its music, even if “You’re One”, a song about Kurt Cobain from their debut Seasick briefly snuck on to some alt-rock radio playlists. By their third album On (2002), they’d evolve into a tight power-pop combo, flush with miniature masterpieces like “Ivanka” where their melodic prowess, rhythmic attack and interlocking vocals all coalesce into a whole that thrillingly builds like the band is careening forever closer to the edge of a cliff without falling off. 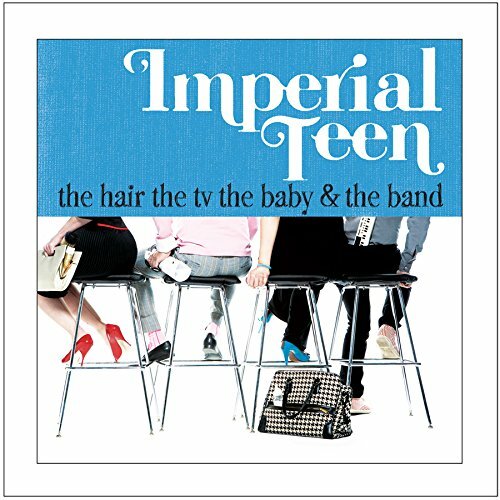 I got to know Imperial Teen through their fourth album, The Hair, The TV, The Baby & The Band; its title cheekily refers to what each member had been up to in the five years since On. Respectively, bassist Jone Stebbins found side work as a hair stylist, Bottum scored the short-lived ABC series Help Me Help You, drummer Lynn Truell was currently an expectant mother and guitarist/vocalist Will Schwartz had his own musical side project, hey willpower. One suspects Schwartz might’ve also been the driving force for getting Imperial Teen back together, as he sings lead on all but three of the record’s dozen tracks. It’s likely I would’ve become a fan had I heard any of the band’s previous albums first, but I consider myself lucky that I came on board here—The Hair… could be one of the all-time hookiest albums I’ve heard, packed front to back with nothing but clever, concise and supremely catchy tunes. Call them a queer, co-ed, semi-acoustic Ramones, but even that description would obscure the complexities in their countermelodies and overlapping vocal harmonies. Opener “Everything”, a thrillingly sped-up take on “Be My Baby” grandeur carefully crafts a mini-wall-of-sound without a hint of Spector-ish pretentiousness—it gleefully employs cymbal crashes, a one-two-three-four! count-off, a heart-stopping chord change at its middle-eight and rhymes such as “democracy” with “hypocrisy”. It sets the stage for a slew of likeminded ravers: “Shim Sham” (with lead vocals from Truell), which emulates the trash-culture party aesthetic of early B-52’s (albeit with very different vocalists); “One Two”, a call-and-response shout-out that chugs along rapidly without seeming to ever break a sweat; “21st Century”, teeming with ecstatic cries of “Count! Down!” and angular guitar stabs that wouldn’t be out of place on a Sleater-Kinney song. My favorite of these scrappier garage-rock numbers is “Sweet Potato”, where a lovably stoopid, nay, remedial guitar riff and matching beat backs up one killer lyric after another: “They put her in the bottom three for singing ‘Tea For Two’,”; “Got a backstage pass but she doesn’t want to meet the band,”; “The carpool lane is open but she’s takin’ the bus.” Each one is followed by the song’s title, but the chorus is arguably even better: “Anyone, anywhere, anyway, LET’S GO!,” repeated over and over, not holding any hidden meaning but immensely enjoyable just for the sheer fun of it. As is their wont, Imperial Teen returned another five years later with their fifth album, Feel The Sound (whose title comes from The Hair’s… delicate Bottum-sung, closing ballad “What You Do”.) With production much fuller and airier than any of their previous work, it was thoughtful and mature, but not nearly as much fun (apart from “Out From Inside”, which could’ve been lifted off an old Scooby-Doo, Where Are You? episode.) At this writing, their website hasn’t been updated in four years, so they haven’t officially broken up. Still, given their track record, it would not surprise me to hear about a new Imperial Teen record tomorrow. Even if they have long since ceased smashing their guitars, I’d still be curious to hear how middle age is treating them. Up next: Still a Weirdo.